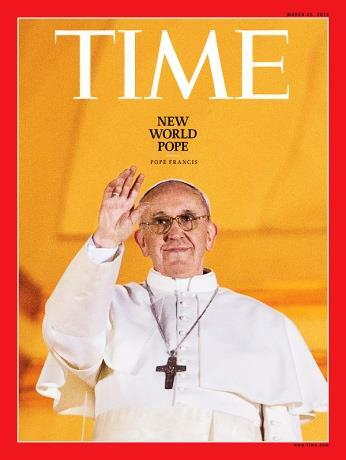 This suggests an end-time emergence of a geopolitical coalition with a papal head that will dominate the world. The evolution of that bond is Biblically foreseen and has been moving forward on two fronts: One, papal; two, through the United Nations, via its international organizations. Stunning?! That was only the beginning. This “Roman agenda” to achieve world dominance had actually been outlined in the previous century. Even Rush Limbaugh was stunned as to how blatant Francis’ document was in support of this ideology. As the voice of Rome has been increasingly heard and even esteemed by world leaders (a Revelation 17 requirement to bring in the end), a new global order has presumptuously been materializing (a Revelation 13 requirement to bring in the end). In 1940, the Carnegie Endowment for International Peace published a document called “The New World Order.” It was a plan that was to bring global stability following WWII. Adopted by the U.S. State Department, it defined a geopolitical strategy to bring in permanent peace. The agenda demanded that the world be divided into a coalition of ten main regions (echoing the ten horns of Revelation 17:12-13). Pennsylvania cartographer Maurice Gomberg developed a world map for those agencies. It had a narrative overlay which objectively outlined “moral ideals” for all nations! It was published on February 25, 1942. Those geopolitical objectives were dubbed a “New Moral Order.” Intriguingly, many of those ideals had been outlined by President Franklin D. Roosevelt on January 6, 1941, in his State of the Union speech. Then followed these reflections and developments. John Robbins fearlessly spoke out: “The Roman church state is a hybrid – a monster of ecclesiastical and political power. Its political thought is totalitarian and whenever it has had the opportunity to apply its principles, the result has been bloody repression. “I saw a woman sit upon a scarlet coloured beast” “With whom the kings of the earth have committed fornication, and the inhabitants of the earth have been made drunk with the wine of her fornication.” (Revelation 17:3, 2) and “The ten horns which thou sawest [on the beast] are ten kings…. These have one mind, and shall give their power and strength unto the beast” (Revelation 17:12-13). “Power was given him [the beast] over all kindreds, and tongues, and nations” (Revelation 13:7). That phrase was branded as Catholic dogma, and then part of its “moral theology” in the extensive works of Thomas Aquinas, Summa Theologica (written 1265–1274). The “common good” became an arresting ideal which was later incorporated into Catholic Social teaching, now increasingly mesmerizing Protestant and political leaders. It claims “the human person cannot find fulfillment in himself, that is, apart from the fact that he exists with others and for others.” The adherents of “common good” point out that this reflects the “community of others” found in Matthew 25:35-40. Serving the social matrix, however, takes precedence over the individual. This is a sinister concept with Marxism as its roots. It is drawing ecumenical interest from Protestant leaders who are unaware of its erosion of personal responsibility and loyalty to God. It will soon become a tool for georeligious coercion, bringing about a world crisis – perhaps mandating weekly worship. Marxism and its “common good” ideals have never been fully implemented. It simply cannot work without oppression. Its adherents have always used force to try to create its utopian “collective good.” Centralizing of some power is currently being played out in a myriad of devastating global initiatives. 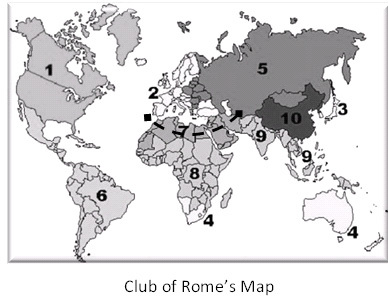 The “Islamic” horrors of the Middle East reveal the emergence of “region seven” of the ten-regional map of the Club of Rome. It is to be one Islamic crescent. That is part of a new global order. Most have noted with horror the death, abductions and torture of Christians. But – there has also been a “death of outrage” (borrowing a phrase from Bill Bennett’s book with that title) against these atrocities. Provide moral and political cover to politicians supporting immigration reform and the federal government’s move to bring in undocumented individuals as part of treating “the stranger” as the Bible suggests. Do you sense an intensity of thought where force to conform might be required? Recently, Pope Francis celebrated a Sunday evening vespers with Protestant leaders. He laid out a formula for Christian unity by stating that the “gospel enables us to overcome proselytism and competition.” Do you see what he just said? This destructively strikes at the very root of Christ’s commission (Matthew 28:19-20) and urges Protestants to do “it” the Catholic way! A trend is developing where the world must treat “religious extremism” as a bad political issue (referring to the “Christian Right” – conservative Christians). “What is needed is an Organization of United Religions, a U.N. of Religions.” Peres envisaged a “top-down” authoritative organization, with Pope Francis as its head. What happens at the end of those one thousand days? The ideals for the “common good” of the world must be in place and activated. The Millennium Development Goals were agreed upon by world leaders in 2000 and set for the international community the challenge of eradicating extreme poverty and hunger, achieving universal primary education, improving maternal health, and reducing child mortality, among other goals, by 2015. The thousand day countdown began in early 2013. Francis frequently lashes out at capitalism, trickle-down economics, economies of exclusions and the culture of death. The Secretary General and all the heads of major U.N. agencies later flew to Rome to meet with Francis on May 9, 2014, to deal with those global issues. Though he again denied Marxist thinking, the message was just that. He decried secularization within the capitalist world. Forcefully respond to the dramatic events taking place in Northern Iraq, where Christians and other religious minorities are being persecuted. Perhaps the most important geopolitical coalition, outside that of the Secretary General of the United Nations allying himself with Pope Francis, is the deepening bond between President Obama, the Democratic Party and the Vatican! “President Obama increasingly is finding a key policy ally in the Vatican, with Pope Francis standing virtually shoulder to shoulder with the White House on income inequality and a historic diplomatic reboot with communist Cuba. The pontiff next year also appears poised to offer greater support to the president on climate change initiatives and reportedly wants to be a leading voice at a U.N. global warming summit next year, where the American president will make perhaps his greatest pitch to date for more dramatic action on the environment. “For Mr. Obama and fellow Democrats, aligning with Francis offers clear benefits in the short term, as they are able to highlight agreement on controversial issues with one of the most respected figures on the planet [the pope]…. “It [the earth beast] exercised all the authority of the first beast on its behalf, and made the earth and its inhabitants worship the first beast, whose fatal wound had been healed” (Revelation 13:12). “As we approach the last crisis, it is of vital moment that harmony and unity exist among the Lord’s instrumentalities. The world is filled with storm and war and variance. Yet under one head – the papal power – the people will unite to oppose God in the person of His witnesses. “‘These have one mind.’ There will be a universal bond of union, one great harmony, a confederacy of Satan's forces. ‘And shall give their power and strength unto the beast.’ Thus is manifested the same arbitrary, oppressive power against religious liberty, freedom to worship God according to the dictates of conscience, as was manifested by the papacy, when in the past it persecuted those who dared to refuse to conform with the religious rites and ceremonies of Romanism. ”The Lord’s day becomes the day of the Church when it helps to experience the beauty of a Sunday lived together, avoiding the triviality of a consumerist weekend, in order to achieve at times experiences of fraternal communion among families…. “We Christians cannot live without the Sunday Eucharist…. “The economic and financial crisis which the world is going through summons everyone, as individuals and peoples, to examine in depth the principles and the cultural and moral values that underlie social coexistence…. “Recognizing the primacy of being over having and of eithics over the economy, the world’s peoples ought to adopt an ethic of solidarity to fuel their action. This implies abandoning all forms of petty selfishness and embracing the logic of the global common good which transcends merely passing and limited interests…. “In a world on its way to rapid globalization, orientation towards a world Authority becomes the only horizon compatible with the new realities of our time and the needs of humankind…. As this modern-day social evolution unfolds, a cry for a “spiritual common good” will come. Something, perhaps, to be concerned about. The question: Who will be that “world Authority?” In those Catholic documents the “A” in authority is capitalized. It doesn’t refer to Christ. A deeper question perhaps: Who will be our Authority? White, Ellen G.; Testimonies, vol. 9, p. 11 (1909). White, Ellen G.; The Great Controversy, p. 565 (1887). Barrett, E. Boyd; Rome Stoops to Conquer (Julian Messner, Inc., New York – 1935). Fowler, Franklin S., Jr.; The Last Geopolitical “Order” (Christian Heritage Foundation, 2014). Warburg, James P.; February 9, 1950, testimony before the Senate Foreign Relations Committee. Rand, Ayn; Captialism; the unknown ideal – An Answer to the Papal Encyclical Progressio,” 1967, pp. 315, 362. Ellen G. White, The Great Controversy, p. 578 (1887). John W. Robbins, Ecclesiastical Megalomania, 1995, p 195. Bennett, Bill; Death of Outrage (The Free Press, Simon & Schuster Inc.; New York NY 10020; 1998). http//www.obioraike.com/paper-presented-catholic-social-teaching-and-the-common-good.pdf Msgr Prof. Dr. Obiora Ike, Catholic University, Enugu. Vatican News, January 28, 2015. Blair, Tony, Tony Blair’s Faith Foundation, January 2014. Retired Jewish President Shimon Peres, The Jewish Post, September 2014. Butler, Matthew; Global Research, “Spirituality in the New World Order. Is a One World Religious Authority in Formation?” March 16, 2015. Vatican Radio, April 9, 2013; http://www.ewtn.com/vnews/getstory.asp?number=125051. Castellano Lubov, Deborah; Zenit.org, Vatican City, August 13, 2014. Turkson, Cardinal Peter; Head, Pontifical Council for Justice and Peace, Towards Reforming the International Financial and Monetary Systems in the Context of Global Public Authority, 2011. White, Ellen G.; Maranatha, p. 187. Turkson, Cardinal Peter; op. cit.